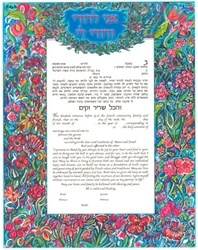 Florage 17" x 22" (Giclee) - This ketubah is full of life and color. The original was created using many layers of paint combined with collage. 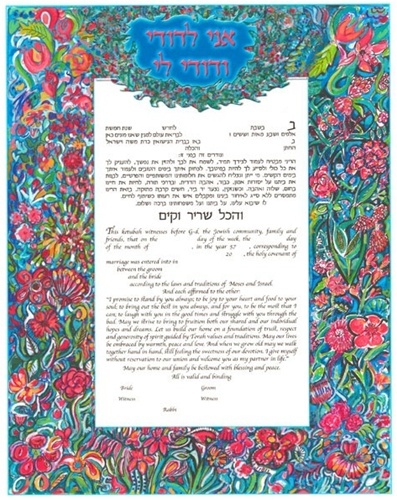 The favorite saying from Song of Songs, "I am my beloved and my beloved is mine" floats on a vibrant blue background. Bernice is a retired art teacher, exhibiting painter, ceramist, jewelry designerand illustrator of Jewish life. She has boundless creative energy and her work reflects her passions. She enjoys using a variety of media and has the gift of easily moving from one to the next as it suits her expressive needs.